Finally! 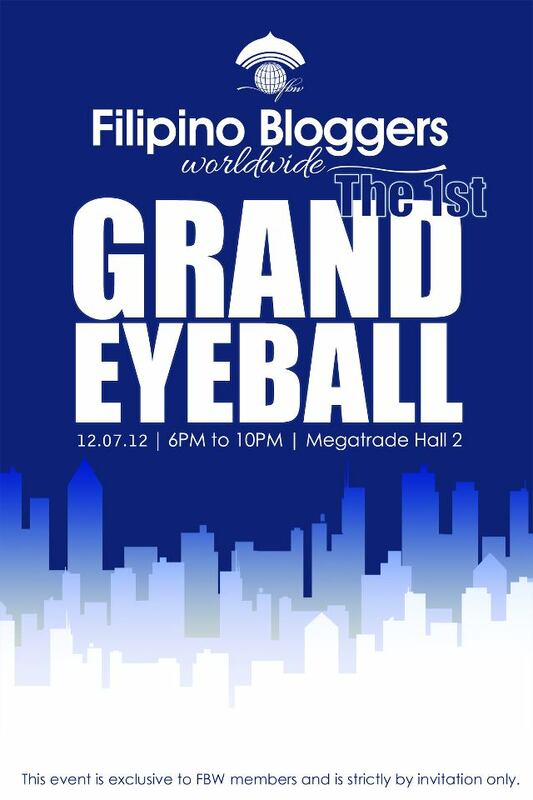 After over a year of inception, Filipino Bloggers Worldwide (FBW), in partnership with Ex-Links Events, presents Filipino Bloggers Worldwide: The 1st Grand Eyeball. Get to meet your favorite Filipino bloggers and mingle with like-minded individuals this December 7, 2012 at SM Megamall’s Megatrade Hall 2 from 6pm to 10pm, and enjoy a night packed with fun learning, interactive games, meaningful conversations and special surprises! Brand partners on the other hand, can expect not just additional exposure to blogger attendees, but a long-term, fruitful relationship and support from Filipino Bloggers Worldwide. Filipino Bloggers Worldwide (FBW) started as a Facebook group on November 1, 2011. As the name implies, the group’s purpose is to unite all Filipino bloggers around the world. The group was easily recognized in the blogosphere in just less than a month. Since then, Filipino Bloggers Worldwide became the number one Facebook Filipino bloggers group. Furthermore, FBW was recently awarded as one of the Top Emerging Influential Blogs for 2012. The creators of FBW expressed that every blogger may have different reasons when it comes to blogging, but each and everyone in the community strives to make FBW an active and supportive group for Filipino bloggers worldwide. So come, join us in this momentous event, and be a proud Filipino blogger worldwide. 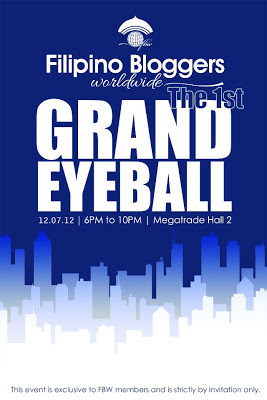 Filipino Bloggers Worldwide: The 1st Grand Eyeball is brought to you by Filipino Bloggers Worldwide, Ex-Link Events, Bo’s Coffee,ShareTea Philippines, B’s Cupcakes, Water For Less Purifying System,Breakfast Magazine, Azta Urban Salon, Ystilo Salon, Beauty by Ria,Bagellia Filipinas, Tough Brat Bags, VESTI, Always 10 List, Frank & Carol’s, Pinky Toes PH, Jana Kathryn, Kikay Konek, Astigirl by Tweet Sering, Blogger Manila, Gadget Gambit, Tower Camp Phils., Inc., Say It Nessie, Budget Biyahera, The Purple Doll, Shopping with Juan, and Smart Mommy Online. We will be using #FBW2012 as a Twitter hashtag so keep updated!